Help choosing the perfect Gamer Gift this year! Looking for an unforgettable holiday gift for the gamer in your life, but you wouldn't know a meeple from a D20? We can help! Our team of Viking Lumberjacks locked themselves in a small room for 7 days to write this handy guide to gifts for the gamer in your life. Can't decide? You can always grab a Gift Card. They never expire and ship in 3-4 days! Does your gamer enjoy games like Dungeons and Dragons or Pathfinder? If that is the case, we have a ton of options. First, check out our Sentinels and Dragon Sheaths. Both are personal carriers for dice, miniatures, and other accessories. If your gamer has a huge collection of oddly shaped dice filling your home, go with a Sentinel with a ‘Triple Top Interior’ and a ‘Honeycomb Bottom Interior’. If they tend to travel lighter, go with a Dragon Sheath with ‘Interior B’. Then, just choose a wood and a thematic sculpt or engraving. If your gamer often plays the role of ‘GM’ or ‘Game Master’, our brand-new Valhalla Screens will make them the envy of their group. If your special gamer loves board games, look to or Dragon Trays and Sentinels. Our Dragon Trays are fully sculpted rolling trays that double as fine art that hangs in the game room. Our Sentinels offer a great place to store tokens for games during play, acting as a ‘bank’ for all players. It even offers storage for long games that can’t be finished in one session. Is your gamer into Magic: The Gathering or The Game of Thrones Card Game, we have 2 great options for them. 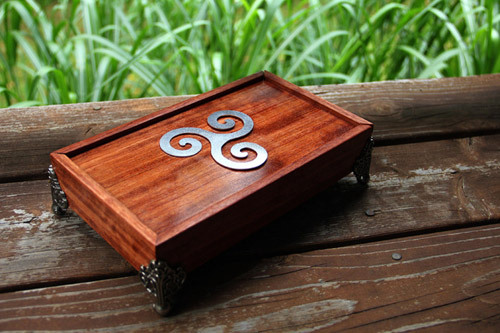 Our traditional Deck Boxes are strong and sturdy and hold over 100 double sleeved cards. Our new Sentinels are great for Card Games that require a lot of tokens during game play. If your gamer plays Game of Thrones or the Legend of the Five Rings, pick ‘Triple Card Bottom Interior’ and ‘Six Top Interior’. Do they have a HUGE dice collection? Any gamer will tell you that Dice are vital. 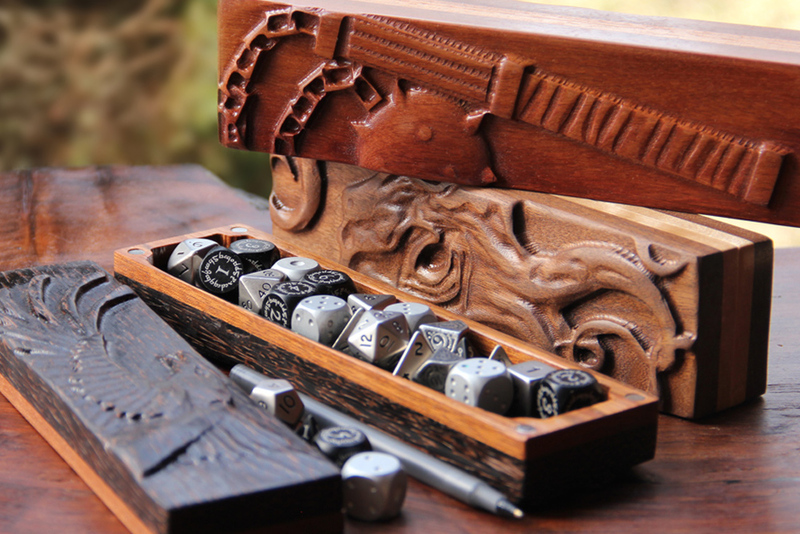 If your gamer has a bucket full of them, check out our Dice Chests – they hold up to 96 standard dice! 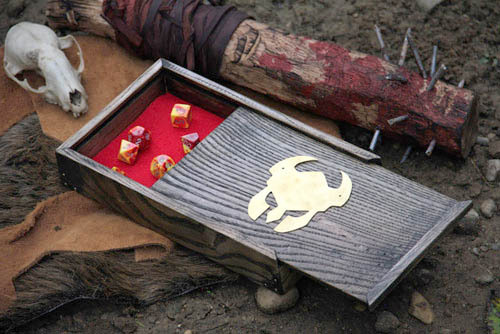 If they have only a few sets of dice that they use regularly, a Dragon Sheath may be a better choice. Does your gamer have posters of dragons everywhere? Or maybe a tentacled beast named Cthulhu? All Dog Might products are highly customizable, ensuring that every gamer can immerse themselves in their favorite style. Be sure to pick out a sculpted design or symbol for your order that complements your gamer's favorite classic gaming motifs. If you have any questions about ordering the perfect gift for the gamer in your life, we would love to help – contact us and tell us a little bit about their interests! We can help you find the right fit.